In just a few short years the Shanghai Gold Exchange has become the world's largest physical gold market, with connections to Hong Kong, Dubai, and perhaps even soon with Malaysia. 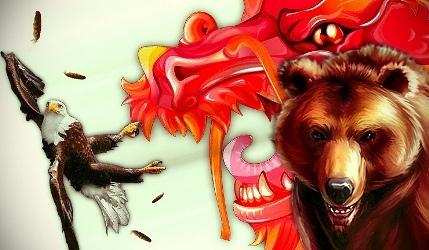 But before the latter one happens, possibly as soon as later this year, China just announced a new and even bigger partnership on April 19 when the SGE signed an MOU agreement with the Moscow Exchange to facilitate direct trading in their respective gold markets. On 19 April 2018, Moscow Exchange signed a Memorandum of Understanding (MOU) with Shanghai Gold Exchange (SGE). The agreement aims to promote cooperation between China and Russia in the sphere of gold exchange trading. The signing ceremony with Igor Marich, Managing Director of Money and Derivatives Markets, member of MOEX Executive Board, and Song Yuqin, Vice President of Shanghai Gold Exchange, took place as part of the third annual "Global Gold Market Summit 2018" in Xiamen (China) organized by SGE. MOU provides for Russian and Chinese precious metals markets and exchange products information sharing, organization of joint conferences concerning topics of gold market, training and staff exchange as well as seeking opportunities for business cooperation. I have read that China will allow gold into the country, but will not let gold leave. If this is so, how can they "trade" with Russia? Through Hong Kong gold market.